Something for the boys and a giveaway too. One of my favorite new toys this season is Trash Pack. That’s right – Trash Pack. Last week I wrote about the new Cabbage Patch Kids dolls and that prompted many of you to share your memories about them. I like to write about toys that grandparents remember and are new again. But this week I’m mixing it up with something that is completely new – and mainly for the boys. The girls will enjoy this one too. A few weeks ago I featured Trash Pack in my A Time to Play Showcase roundup and now here is my full product review and giveaway. One of the trends I noticed for this year is that lots of collectibles are being featured. Kids have always loved collecting things - playing with them, showing them off and trading with friends. In my generation it was baseball cards and my son had cases full of ninga turtles. At A Time to Play one display that everyone stopped at, picked up stuff to look at, took pictures of and smiled at was Trash Pack. The children who were there - boys and girls - were all interested in playing with the trashies – they are sooo cute. 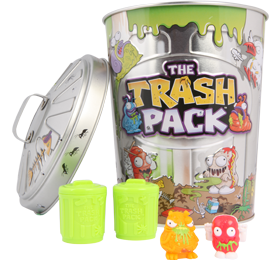 Trash Pack is eye catching and keeps your attention with the big variety of little trashies. The trashies are squishy and stretchable and fun to play with. The Trash Can is a collectible case with layers of little compartments that hold a single small trash can with a little “trashie” in each one. There are over a hundred different trashies each with a name more gross than the next. There are Mucky Maggot, Rankenstein, Smelly Sock, and Stinky Cheese to name a few. I know it sounds awful but they are actually very cute. The playsets are under $20 and you can buy a small two pack for $2.99. I haven’t seen another toy with these price points anywhere near as much fun as this one. I like the idea of collectible sets for grandparents who like to bring a small gift when they visit or their grandchildren visit them. A child can bring their collection to show off or play with when they visit and you can always have the perfect, low cost, and appreciated small gift for them. The two pack of trashies will make great stocking stuffers – for any age. And woo hoo – this is a quiet toy! No electronics and no noise! Trash Pack items are available in stores exclusively at ToyRUs. They are also available at Amazon and you can click below to go directly to Amazon. My grandson, Zach, is two years old. I have had my sample to review on the counter in my office and he reaches up for it and then holds it in both hands up to me and says to me “Garbage can - Open it up.” But it is labeled 5 and up so Mommy said no for right now. He really doesn’t put things in his mouth and Grandma thinks he will enjoy the trashies but for now I will have to put it out of the way. He’ll be getting something else from Grandma’s pile - a Transformer Rescue Bot. Mommy said he could have that - Check back for that review soon. 1. Leave a comment here on my blog. You can send me your email address when you enter – marionconway@aol.com or leave it in your post. . Deadline to enter: October 25, 2011 at midnight. The winner will be selected using random.org. Update: Congratulations Susan on winning The Trash Pack. I'm sure that your family will have a great time with this oh so cool set. Full Disclosure: I received a sample Trash Pack. This review is completely my own opinion. I'll be writing product reviews over the next couple of months, so check back for more opportunities and ideas for great holiday gifts. My grandsons do like small collectible toys, and they are over 5! My email is grandparents.guide at about.com. Congratulations, Susan. You are the winner of The Trash Pack. We'll be sending it to you soon. A New Cabbage Patch Updated Doll and Giveaway!! !